I love reading but my time is limited so I rarely get time to read. There is nothing like curling up in bed and reading a good book. I tend to enjoy the mystery and suspense books the best. So when I was offered the opportunity to read Scott Gelowitz’s The Book of Adam – Town Secrets in exchange for an honest and unbiased review I agreed. I thought what a great way to discover a new author. 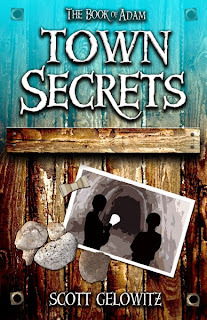 The Book of Adam- Town Secrets is geared more towards the young adult group. I still enjoyed it and actually appreciated a book I could get engrossed in, engage with but I could easily put it down to take care of life in general and come back to it without missing beat. The book is very well written and flows nicely. I really enjoyed reading about Adam and his three friends. The story was written to be a page turner and keep you wanting to read more. I hope there are more books to carry on the adventures of Adam. I received an ebook copy of The Book of Adam – Town Secrets by Scott Gelowitz complimentary for evaluation purposes. Regardless, all opinions expressed are still 100% my own. I am disclosing this in accordance with Federal Trade Commission 16 CFR, Part 255 Guides Concerning the Use of Endorsement and Testimonials in Advertising.